“Let’s go!” is one of the many possible interpretations of Racha Fora, but the one most apropos to this ensemble might be “branch line”—in this case running from Brazil to Japan, a link older and deeper than you might imagine. Racha Fora’s sound is, appropriately, at once delicate and propulsive, acoustic and electronic, and fleet of finger and mind. New York, NY- Club Bonafide, located at 215 East 52nd Street, New York, NY Presents Racha Fora on Friday, December 11, at 11:00 PM. Tickets are $10.00 and can be reserved by calling (646) 918-6189 and by visiting www.clubbonafide.com. Racha Fora, led by flautist Hiroaki Honshuku, was formed in 2010 originally as a quartet by two Japanese and two Brazilians in Boston, MA. Honshuku holds a Master’s Degree from New England Conservatory, which is where he began assisting legendary band leader, composer, and theorist George Russell. Honshuku is known as one of the few composers who practice Russell’s Lydian Chromatic Concept. 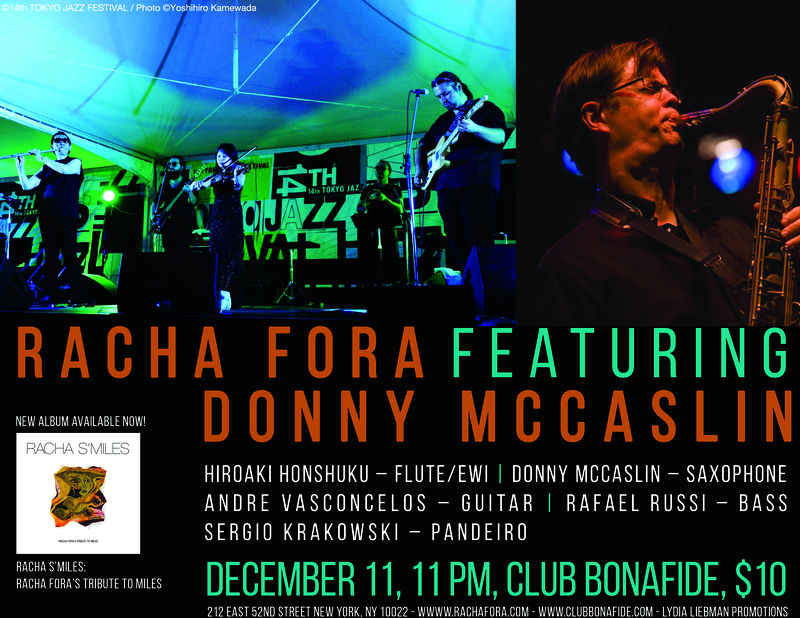 Joining Racha Fora is the incomparable saxophonist Donny McCaslin. Thanks to the high profile of the Dave Douglas Quintet, McCaslin in the last two years has achieved wider praise for the incisive twists and purposeful turns of his emotionally charged solos. But those qualities – along with his sometimes startling virtuosity, and his distinctive voice as a composer – had actually been on display for much of the previous decade, during which McCaslin proved himself a valued sideman on recordings by Danilo Perez, Luciana Souza, and performances with Tom Harrell, Brian Blade, John Pattitucci, The Mingus Band, and Pat Metheny. . Meanwhile, the previous albums under his own name have shown him subtly incorporating elements of Latin American music within adventurous jazz frameworks. This dynamic approach fits well with the worldly concept of Racha Fora. In Hiro’s own words: “My goal is to create a new jazz sound using native Brazilian rhythms. This is not Brazilian Jazz but rather jazz with native Brazilian grooves,” he says. Racha Fora issued its debut album in 2012, which featured Honshuku’s compositions, and embarked on a tour of Japan, which became an annual affair. This fall, Racha Fora released their second album on the JazzTokyo label, “Racha S’Miles: Racha Fora’s Tribute to Miles”. The sophomore release, which features NEA Jazz Master David Liebman as a special guest, has been marked by a successful tour of Japan and various accolades. Filling out the Racha Fora ensemble is guitarist Andre Vasconcelos, bassist Rafael Russi and Sergio Krakowski on pandeiro. Club Bonafide opened this year under the co-ownership of world-renowned bassist Richard Bona and restaurateur Laurent Dantonio. Club Bonafide functions as an intimate listening room and bar sourced primarily from local businesses.